AUSTIN, TX—As indicators prove the economy is getting stronger and consumers place a greater emphasis on experiences rather than products, there’s a demand for travel. “In addition to strong economic variables and confident consumers with additional disposable incomes, consumer expectations play a major role in this summer’s record-breaking travel season,” said Noreen Henry, CEO of WayBlazer, a B2B travel technology company. Another factor? The hotel industry is adopting advancements in technology that offer travelers convenience, ease of travel and digital access to the experiences they crave. “As brands within the travel space begin to adopt new technology, consumers are becoming much more likely to book trips. Consumers want convenience and personalization, and brands are meeting these demands through innovation,” said Henry. A former Travelocity executive with a passion for travel, Henry is well-versed in the common pain points travelers experience, particularly around travel planning and how challenging it can be to find the best hotel or destination that matches a traveler’s personal trip needs. So, how can WayBlazer help hotel companies to improve conversion? Henry urges hoteliers to prioritize technology that not only improves consumer experiences, but also drives measurable results to their bottom line and look at customer engagement, conversion or loyalty. Hoteliers should shift their focus toward innovation and how they can make the travel experience more convenient and relevant for the modern travel consumer. Engaging with their customers, where and when the customer wants across multiple channels is key to delivering quality services. Given the growth of mobile, social media and digital, consumers have access to a variety of channels when planning trips. 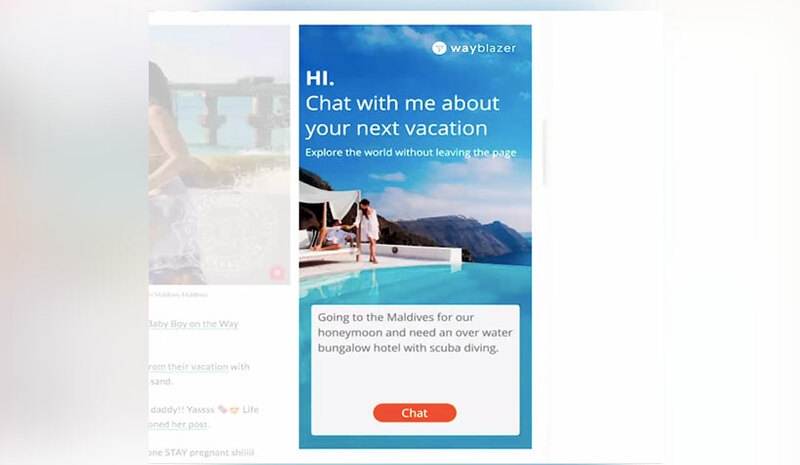 WayBlazer’s travel-centric chatbot can interact directly with consumers to help them with trip planning through messaging apps, voice platforms, websites and even via interactive chatbot ads. WayBlazer continuously is looking for ways to innovate the travel customer experience for its clients.